SEM is widely used to study the surface structure after nanoindentation. The combination of a large field of view with nanometer resolution allows detecting early stages of crack formation, slip steps, and other surface defects indicating the onset of material surface failure. However, quantitative height informa- tion is not available in an SEM. AFM is an established tool for quantitative analysis of nanoindents, but generally lacks larger screening cap- abilities. 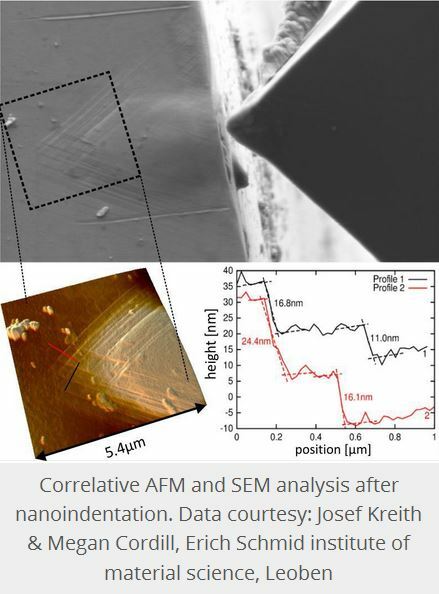 With AFSEM®, SEM and AFM can be combined with nanoindentors for correlative, in situ analysis of nano- indents. 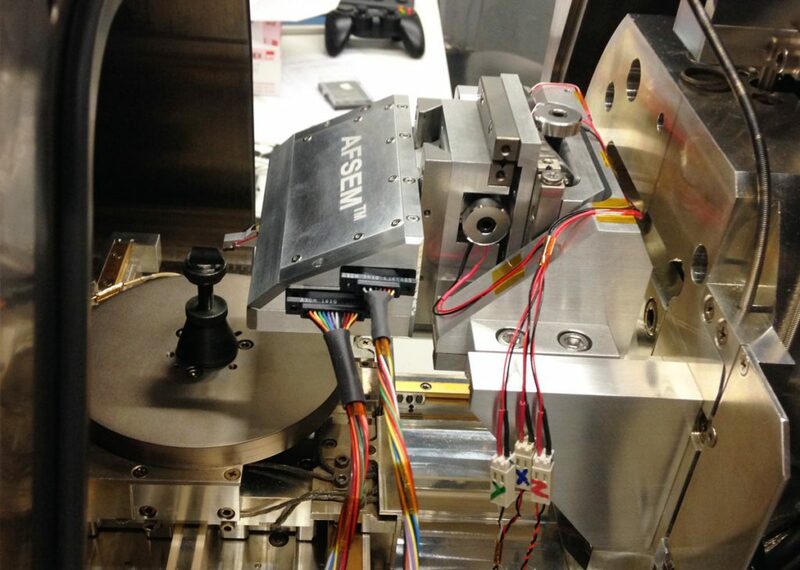 Its tip scanner does not interfere with the use of specialized SEM stages, like a nanoindenter. Consequently, nanoindentation can be used interac- tively with SEM and AFM imaging, performing multip- le indentations with in-between analysis, without the necessity to vent the SEM and take out the sample for each indentation/analysis cycle. The SEM can be used for guiding both the indenter and the AFM. After nanoindentation from the side, slip step analysis can be carried out with SEM and AFM in situ. The SEM provides information over the progression of the slip step area and the AFM quanti- fication of slip step heights. In summary, AFSEM® is the solution of choice to ob- tain overview information of even the smallest surface alterations and quantitative data on crack depths, slip step heights, or the pile up or sink in volu- me around an indent in a single instrument. For analysis of the indentation face, multi-axis flip sta- ges are on the market that rotate the sample after indentation, further extending the possibilities of cor- relative AFM-SEM.